Bluffs Run Derby Captured by I’ll Grantuawish. Saturday Afternoon Bluffs Run trotted out an evenly matched field to contest for the $60,000 3/8 Mile Derby Final and I’ll Granuawish was able to snag the first place money. At the break the dogs broke across the field with the one I’ll Grantuawish with a slight edge followed by number two L’s Racin Russ and the morning line favorite post position three O Ya Chug Alug right there in third position. With the exception of the four hound Slatex Porsche who found no running room early the rest of field encountered little or no trouble especially number eight Competitivespirt who raced as we used to call it on the overland route. Competivespirt stayed wide the entire race and finished in striking distance taking home the show money. I’ll Grantuawish stayed on the rail and held the same advantage throughout the race that he gained on the break. L’s Racing Russ pressed the leader the whole way but couldn’t close the gap and finished in second. This race was one of those cases where the dogs broke and everyone kept their position and while there was no jockeying for the lead it still ended up being a very exciting race as we all watched to see it the leaders could hold on and they did. Here's a Preview of the Four! PEOPLE R CRAZY out of (Kelsos Fusileer – Sneeze Attack) racing for the Legg Kennel, owned by Karen Legg and trained by Crystal Reuer. She made the finals as point leader with 55. O YA CHUG ALUG out of (Dodgem By Design – Jasmines Jewel) racing for the Blake & Black kennel, owned by Gary Reicherts and trained by Linda Willey. She made the finals with 53 points. KB’S JUMBO JET out of (Coldwater Konow – Kil Kaci) racing for the Keeper – Red Rock kennel, owned by Green Smith and trained by Waymon Varner. She made the finals with 44 points. 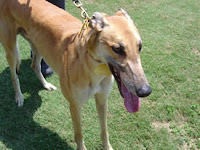 I’LL GRANTUAWISH out of (Jimbo Scotty – Unleashed Energy) racing for the Plum Creek Kennel, owned by Mary Robinette and trained by Monte Hoopes. He made the finals with 44 points. L’S RACIN RUSS out of (Dodgem By Design – Malena) racing for the Boeckenstedt Kennel, owned by Kenneth and Gary LeFebvre, and trained by Chuck Shelton. He made the finals with 43 points. COMPETITIVESPIRT out of (Be My Bubba – Up N Coming Idol) racing for the Plum Creek kennel, owned by David Robinette and trained by Monte Hoops. He made the finals with 43 points. BIODIESEL FUELED out of (Kiowa Sweet Trey – Future Bride) racing for the Plum Creek Kennel, owned by Mary Robinette and trained by Monte Hoops. He made the finals with 42 points. SLATEX PORSCHE out of (Flying Hydrogen – Slatex Station) racing for the Harlan Bros. kennel, owned by G. Kirk Harlan and trained by Lori Fortune. She made the finals with 37 points. Post Position draw will be televised on Wednesday May 26, in the Clubhouse, during the first 8 races. Ebro is running their Ebro Marathon on Saturday May 29th. Last years winner Gil's Juarez was a two time champ also winning in 2008. His winnng time last year was 44.50 and in 2008 44.60. From the information that we could dig up the fastest most recent wintime was by Postal in 2006 with a time of 44.20. As soon as we can get you a lineup and a program link we will post it! We will post the programs for Monday's finals as soon as we get them! Dubuque is running their 3/16ths $2000 Memorial Sprint on Monday May 31st. We love these adrenaline rush 17+ second races! Program link as soon as it is posted! Over a career consisting of two and a half years, C Ya Tom Collins has been one of Gulf Greyhound Park’s most consistent greyhounds competing against the best that Texas racing has to offer. While remaining in top grade AA for most of that time, C Ya Tom Collins broke a four-week winless streak in fine fashion conquering his rivals twice this week to take the honor as Greyhound of the Week. On Sunday May 16, the number five proved to be a lucky number for C Ya Tom Collins competing in the fifth race of the matinee performance and drew the #5 post position. After breaking out of the starting box in the middle of the pack, C Ya Tom Collins rushed to the lead taking a slim advantage around the first turn. Heading for home, C Ya Tom Collins would hold off a late charge from Atascocita Rian to win by one length in a time of 30.30 seconds. The sixth race on Friday evening May 21 would feature a grade AA field in the first half of the mandatory twin-trifecta payout consisting of top grade AA winners C Ya Tom Collins, Soi and last week’s recipient of the Greyhound of the Week award, BOW Big Shot. Once again, C Ya Tom Collins would break even with the field but used his early speed to rush around his rivals clearing second behind race leader, Magnolia Dream. C Ya Tom Collins then carried this momentum to the lead with an impressive move down the backstretch and romped home all alone to a 10-½ victory in 30.39 seconds as the even money betting favorite. (C Ya Costa Maya – San Tan Cool One) for an outstanding week of racing. Our video is from 1988 and features He's My Man in a race from Multnomah.. It was a very eventful week here at Gulf Greyhound Park containing both highs and lows. Mother’s Day was a success at the beginning of the week but then Mother Nature unleashed buckets and buckets of rain over the racing surface forcing the cancellation of live racing all day Saturday. During the week, BOW Big Shot shined brightly through it all earning this week’s honor as Greyhound of the Week. Saturday night at Derby Lane was the site of the running of the Gold Trophy Juvenile Stakes Final and LS Jack Williams grabbed the prize for veteran kennel operators Hans and Elly Limmer by holding on over the hard charging favorite Nicolaus Silver to win the event. Jack Williams was posted in the eight box and things went well right from the start as Number 5 Backwood Ike jumped out first and sealed off the field to the inside while both the number 6 and 7 greyhounds broke slowly allowing Jack Williams an open lane in which to rush to the lead. The eighth race Saturday Night at Derby Lane features eight pups that have advanced from achieving their maiden victories right up to winning against the best of the best in grade A competition over the past several months. Usually you can expect to see the unexpected when young pups meet up but this group while young at age has accumulated a fair amount of racing experience already in their short careers. We have added names to our 2010 All American Team Contenders Survey. Be sure to log on and click the survery button to enter your vote! After the Night of the Stars on July 2nd we will be posting the survey results for the 1st half of the year! "I believe Quick Mcrunfast is the fastest greyhound in America. If there is a faster greyhound in the Country i would love to see him/her. This dog is absolutely breathtaking. I don't know how to post lines anymore but if someone can i would appreciate it. This greyhound gets from the end of the toteboard to the finish line faster then any greyhound I have ever seen. The $30,000 Hollywoodian was run Saturday Night at the Mardi Gras Racetrack and Casino and Crispins Place won convincingly as the public choice at 6-5 odds. The Hollywoodian serves as the Derby for Mardi Gras and is raced over the traditional Derby distance of 660 yards. Each year the eventual winner of the Hollywoodian is looked upon as a potential All-American candidate and much is expected from the champ as the year progresses. On Friday Evening Southland trotted out eight aspiring pups to compete for the annual Spring Futurity Championship and lightly regarded Tomi’s Inazuma shocked the crowd with a stunning upset of odds on favorite Trogelz. The consensus choice Trogelz was coming into this race sporting an impressive ten race win streak and the crowd expected him to keep that streak intact. However a kennel mate named Tomi’s Inazuma decided he wanted to show he had the stuff to compete on this level. Tomi held on gamely from the strong challenge of Trougelz and lit up the toteboard with a win ticket worth $50.80. The 4-8 quiniela returned a modest payoff of $10.10 and the Robert Thorne Kennel as expected went home with the trophy just not how everyone thought they would. It is that time of year again, the $50,000 Texas Round Up Sprint Championship begins in one week, and Gulf Greyhound Park’s hottest greyhound, Gable Eddie, is peaking at the right time. The 2010 win leader has won three consecutive races making the statement to the rest of the Texas-bred competitors, `catch me if you can`. eight-length victory in a time of 29.79 seconds. D.Q. Williams Kennel has loads of top grade AA greyhounds here at Gulf Greyhound Park and this week It’s A Reality has stepped to the front of the line to earn the Greyhound of the Week award. I agree that it is hard to watch as our business goes the way of the dinosaur, but I think we need to understand why it is happening. A long time ago racing, horse and dog, was the only game in town if you wanted to gamble. The take was low, 10-12 percent so good handicappers could make money at the game and even poor handicappers could have a lucky day and make a few bucks every now and then. We are in the business of promoting live greyhound racing world wide and the great people who are involved with it. Images are the property of Rachel Hogue and may not be copied or reproduced in any way without prior written permission. You can buy any of these prints at www.rachelhogue.com.